In late March of 2012 I met with Sam Fitton, who would later become my co-writer. Sam is a good friend with whom I share many common interests, so working together came naturally to us. I booked three nights in November at the Nottingham Arts Theatre and we began working on the show. Why three nights you may ask and not one or two, well the answer is because I like a challenge of filling 900 seats. 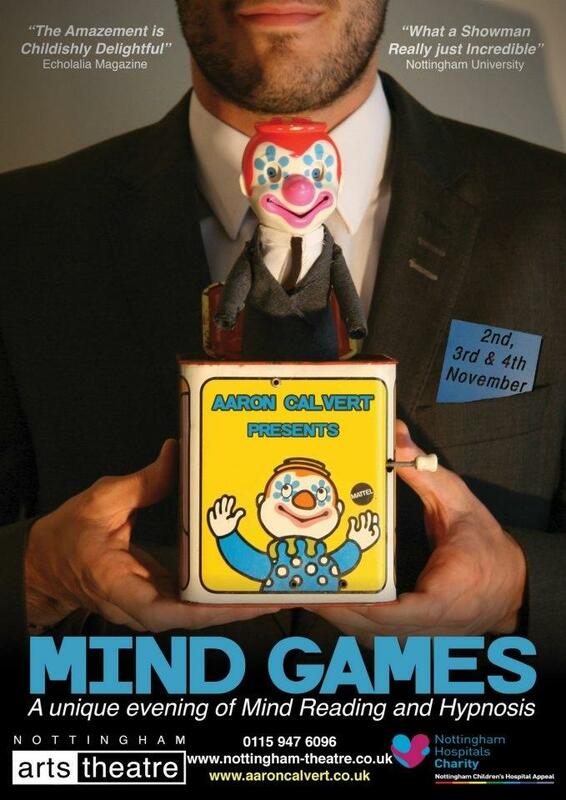 After a much-needed Christmas break, I welcomed Sam and Elizabeth back to produce MIND GAMES 2014. Initially, Sam and I set about editing the original MIND GAMES and, after a few months of cuts and changes, we realised we had in fact transformed the entire show. At the time, we debated whether or not we should have a new name to reflect the new show but ultimately decided to keep MIND GAMES as we liked the name so much. I always forget how much additional work is involved in producing a show, especially now as I am visiting three different cities. Besides the unhealthy hours I spend on Skype or drinking coffee with Sam while we work on the show, there are so many other jobs to do including PR, set building and organising theatre venues. I like to do as much as I can myself, partly because I’m a “perfectionist” and partly because lack of sleep means I have a great many hours to fill. However, to free up some time to allow me to focus on more important areas of the show and to balance the increasing demands of my medical training, I have taken on a small PR team to help me out. 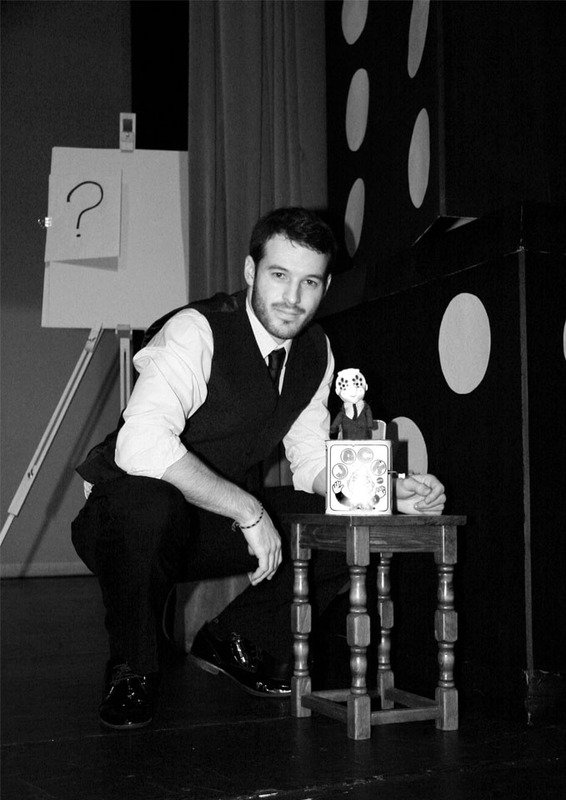 January 2014 saw the return of my talented co-director Tim Berryman whose voice you may recognise from the recent Rimmel London commercials. Also new to the team are sound engineer James Calvert and technical director Nick Platt. For this we set ourselves the challenge of producing a show with a new edge not seen in any of my previous shows. So, after endless hours of Skype, a day of DIY building the set, which you can watch here(youtube time-lapse video). See how it went in Derby, Nottingham and Manchester by reading their reviews. 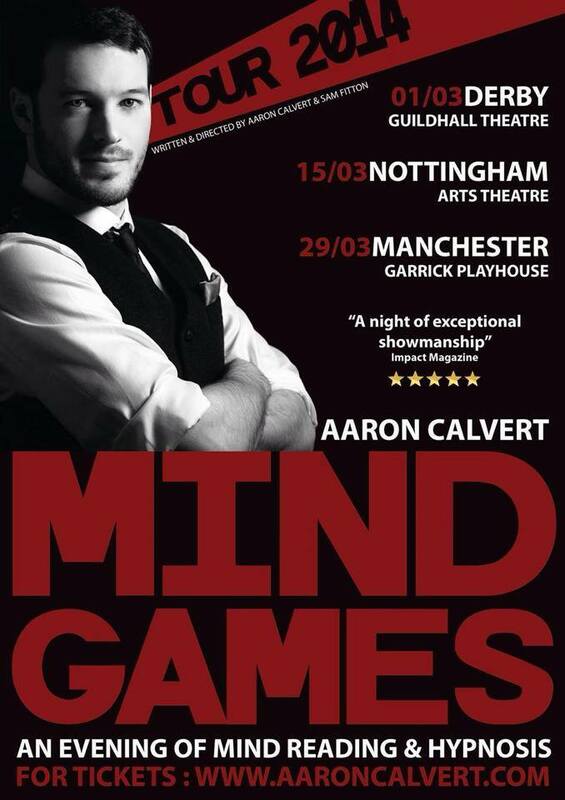 MIND GAMES 2014 had finished, the tour had been a five star success and I couldn’t wait to start planning the next one. For a short while though I had to hang up my mind reader boots as I concentrated on moving to become Dr Aaron Calvert. Here’s a few names from the audiences across Derby, Nottingham and Manchester, if you were at the shows and took part see if you can spot yours. You can read more about each of the individual shows from Derby, Nottingham and Manchester. Or read all of the reviews from the reviews page.